The Block Ice Machine for sale is a new high-efficient refrigeration facility subject to the Africa and Oceania market of Block Ice needs. It adopts an intergrated design with easy installition and transportation. All the sizes of the Block Ice making machines are designed according to the International Container Standard. 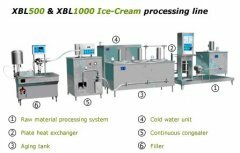 The GM series Block Ice Making Machines have the following specifications of Block Ices: 5 kg/PC, 10kg/PC, 20kg/PC,25 kg/PC, 50kg/PC. 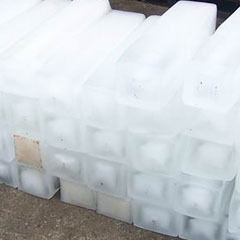 Meanwhile, we also can design and produce the Block Ices with speciation required by the customers. 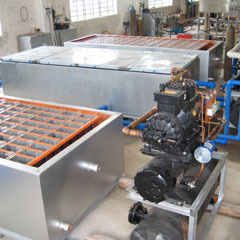 We also provide different kinds of Block Ice Machines for sale to different purposes including large-size cube ice machine, flake ice machine, tube ice machine, marine ice machine and water cooling-packaged chiller.These products are widely used in large ice freezing factories, supermarkets, aquatic production processing, pelagic fisheries, vegetable/fruit processing and preservation, meat processing and concrete cooling. 1 Block Ice machine GC series China 304 stainless steel, High effecicy, low power, low noise. Double 5cm iron board, Embalmment, Heating insulation treatment. GM series Block Ice Machine adopts top brand compressors made in U.S.A., Italy and Japan, with inbuilt energy economizers of own patent. By virtues of more than a decades of experience and research, the Block Ice Maker Machine produced by us have such features as beautiful outline, stable running, easy cleaning and simple operation as well multiple protective functions for the occasions with unstable power supply. The GM series Block Ice Maker Machine is easy to install. It's plug-ready. The ice block is neather to long nor to heavy, it's easy to take out. The GM series Block Ice Maker Machine is designed for tropical conditions and coastal climate.